Dimitrijus and Merin Sazinas are competitive ballroom dancers, paragliders, and outdoor adventurists. They decided to combine all their passions in one... and create Sky Retreat. The vision of Sky Retreat is to be an oasis of fun where individuals and families can retreat from ordinary life and make life extraordinary! Sky Retreat's goal is to bring families together and allow individuals to explore their passions surrounded by the refreshing beauty of nature. Dimitrijus Sazinas (Dima) was born and raised in Lithuania. He is a professional ballroom dancer with decades of dance experience as a competitor, performer and dance teacher. Dima received his university degree in business administration. 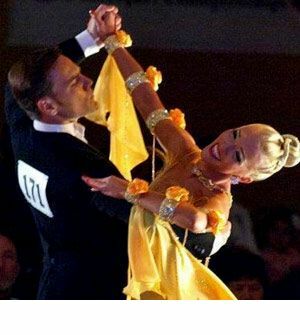 He founded and operated a top ballroom dance school for over 15 years in Charlotte, N.C., while competing as a professional dancer. In his spare time, Dima was always active in other sports such as Paragliding, Skiing, Biking, Water Skiing, etc. With his love of the outdoors and enormous drive for an active lifestyle, Dima and his wife Merin found a location in the Blue Ridge Mountains where all their passions and professions could be combined. Sky Retreat provides a unique destination for elegant activities such as dancing, live music and entertainment, and high energy sports such as paragliding, biking, and hiking. Merin Sazinas was born in California and has lived around the nation as well as oversees. Merin has a passion for an active lifestyle and the balance of inner and outer development of life. Merin is a competitive ballroom dancer with a decade of dance experience as well as a certified LaBlast fitness/dance instructor. 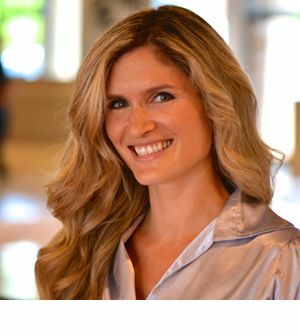 Merin has a master's degree and honorary PhD, and she is a director/certified teacher of the Transcendental Meditation® technique with over 15 years teaching experience. Merin enjoys the freedom of paragliding high over the mountains as well as other activities such as hiking and pilates. Founders of Sky Retreat, Merin and Dima's vision is to create an environment where people can enrich ordinary days to make them extraordinary, enjoy outdoor adventures, step onto the dance floor for some glamour and fun, or relax and recharge in the peaceful environment of the mountains. Marco Stelter spent most of his life living in Germany, but his passion for paragliding prompted him to move the U.S. with his family. He has been paragliding since 1999 and immediately fell in love with the sport. This prompted him to dedicate his life to teaching others free-flight paragliding as well as powered paragliding. Marco received his USHPA instructor certification and tandem pilot rating. He has a refreshing and fun approach to learning the sport, putting people's hands on from their very first steps in paragliding. 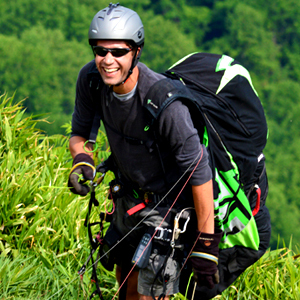 Marco is a full-time paragliding instructor and teaches year round. Koen Vancampenhoudt is from Belgium and has traveled around the world. 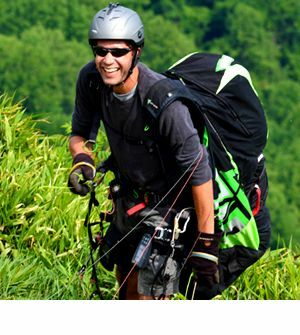 His first exposure to paragliding happened in the Fiji Islands in 1997, when he met a French traveler/pilot who invited him to go for a tandem ride. As soon as his feet lifted off the ground, he knew he had found his calling. Koen became a certified pilot a year later, taking the training in the beautiful cliffs and hills of Goa, India. 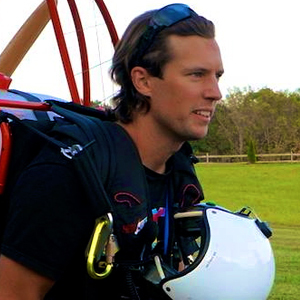 His passion for free flight has continued to increase year by year. He has logged over 1,500 flights in a variety of locations across Europe, USA, and Latin-America. 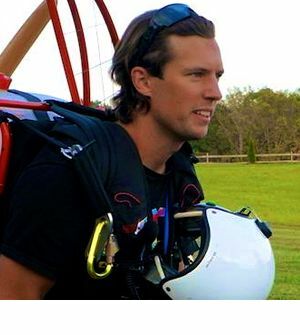 He is an experienced cross country pilot and acro pilot. He is a certified tandem pilot and loves giving others the opportunity to experience the delight of free flight, particularly in beautiful settings like Sky Retreat. 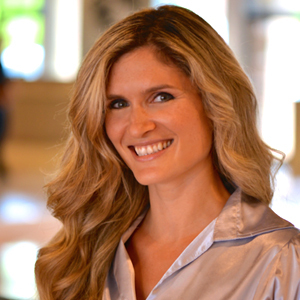 Natalie Grasheim teaches dance and fitness and is a certified yoga instructor. Additionally, she has six years of experience as a professional MC, DJ and Party Motivator. Born and raised in Charlotte, N.C. she has traveled across the country participating in national dance conventions and dancing with professional choreographers such as Marty Kudelka (Justin Timberlake), Kevin Maher (Rihanna, Justin Bieber) and Napolean and Tabitha D'umo (Madonna, So You Think You Can Dance). Natalie wants everyone to enjoy being fit and makes sure everyone has a good time while learning the proper techniques!